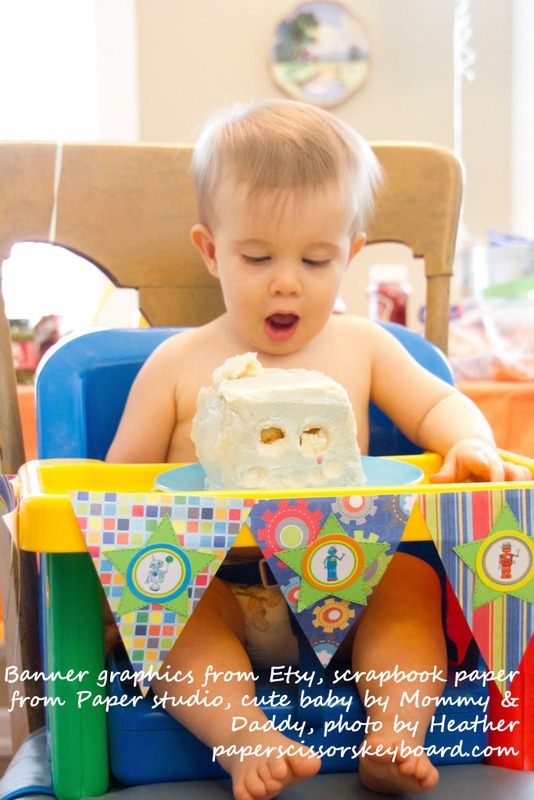 We had a kids-running-around-crazy, box-robot-decoration, way-too-many-cupcakes, left-the-juice boxes-for-the-kids-in-William’s-car kind of party for T’s first birthday. It was so much fun and I’m so glad so many of our friends and family got to be there. 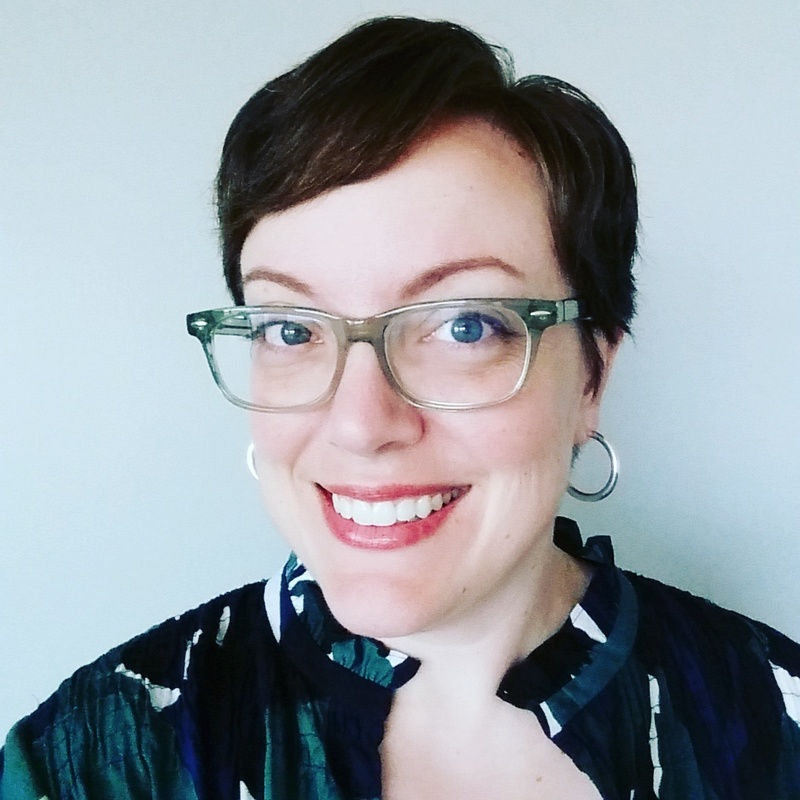 I got some great ideas for the party from my talented friend, Domenica, and some other great ideas from etsy. 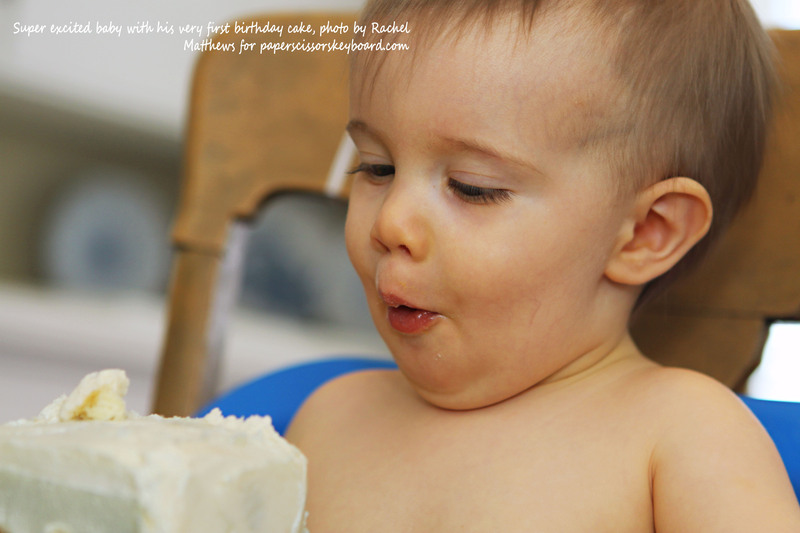 If you are in no way interested in the birthday party recap, feel free to leave with no guilt. Luckily, William’s parents have a big house that is open to us (we could have fit all of 3 people in our apartment). Also, luckily, I knew that my amazing friends Heather and Rachel would have their trusty cameras there and I wouldn’t have to worry about capturing the moments. So, here’s what we did! 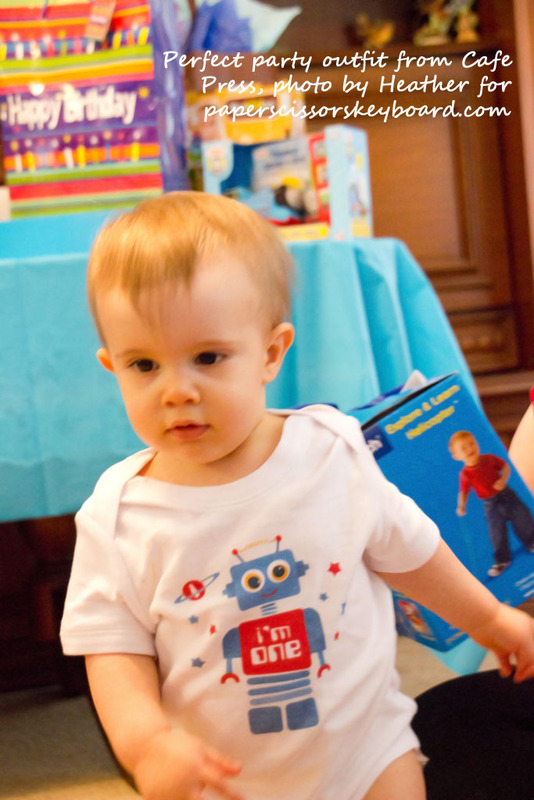 I got a super-cute onsie with a robot for T to wear for the big day. 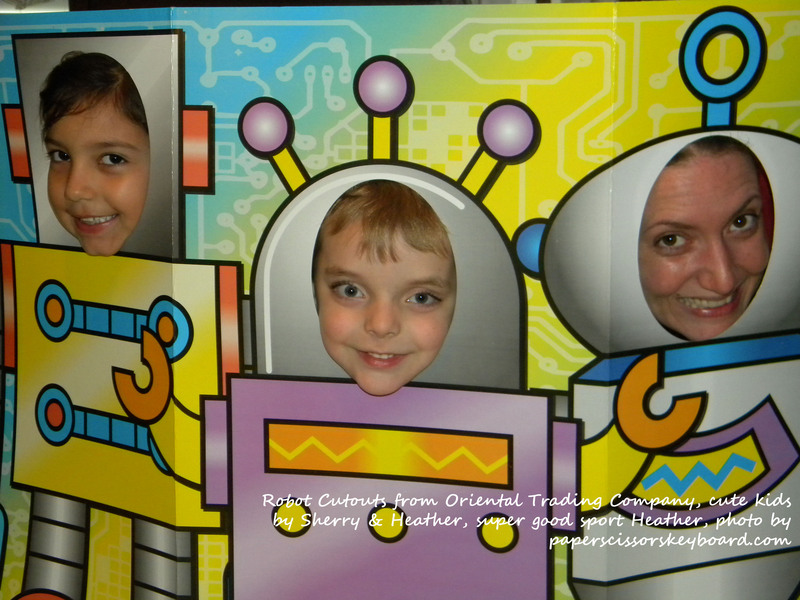 The robot’s belly says, “I’m One!” on it. Perfect for a party outfit. We built a robot who guarded the goody bags. 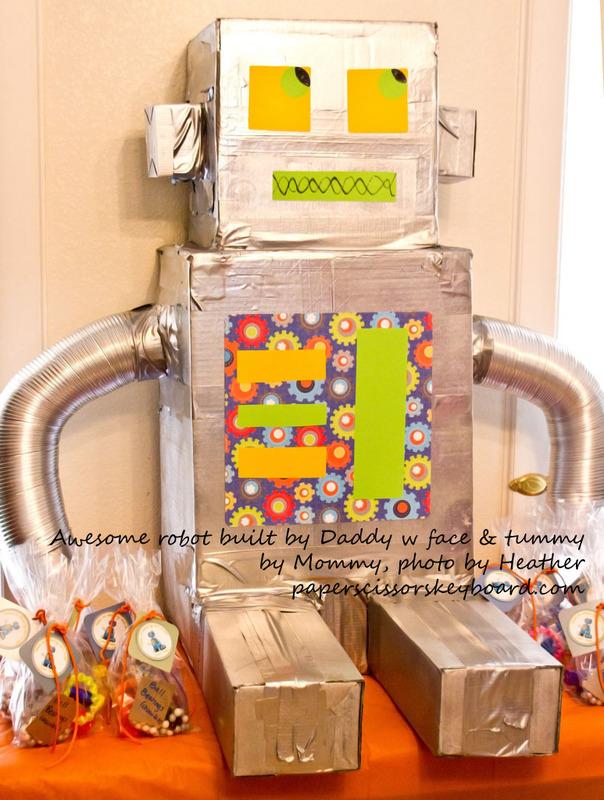 The robot is made of boxes, dryer venting, scrapbook paper, and silver paint. 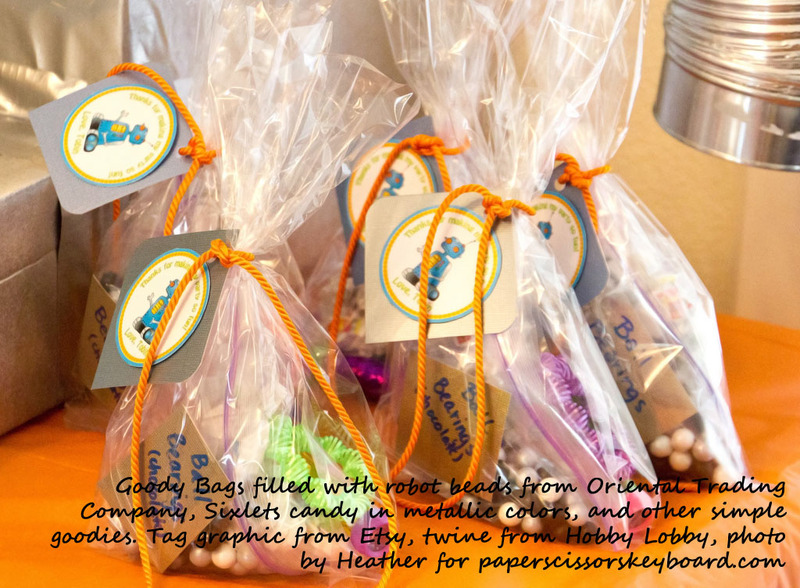 The goody bags included robot-shaped foam beads to craft with, Sixlets candy in shades of silver and black (I called them “ball bearings”) and some miscellaneous stuff. 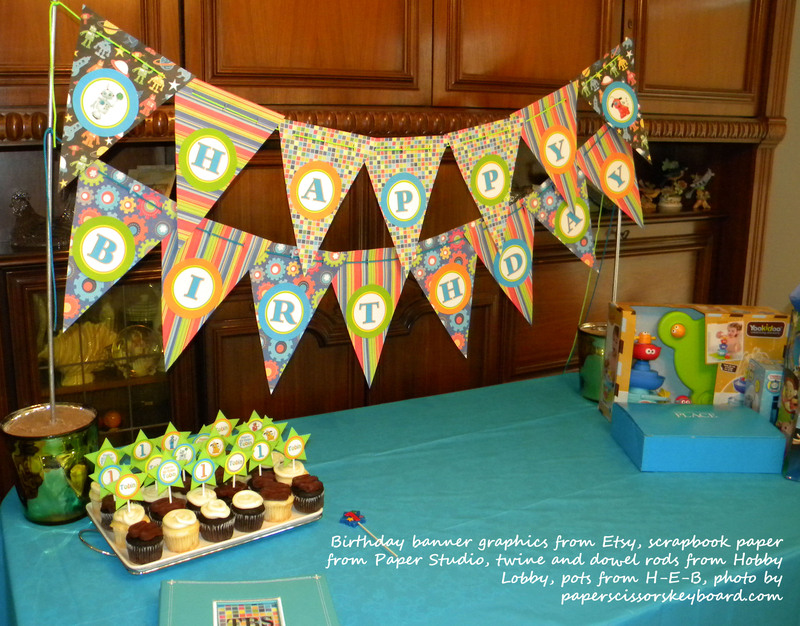 We made a birthday banner using the cute graphics I got from etsy, my trusty scrapbook paper (Paper Studio from Hobby Lobby), two dowel rods painted silver, and two pretty glass containers filled with sand. We made fun cupcake picks from my etsy purchase and stars I punched. 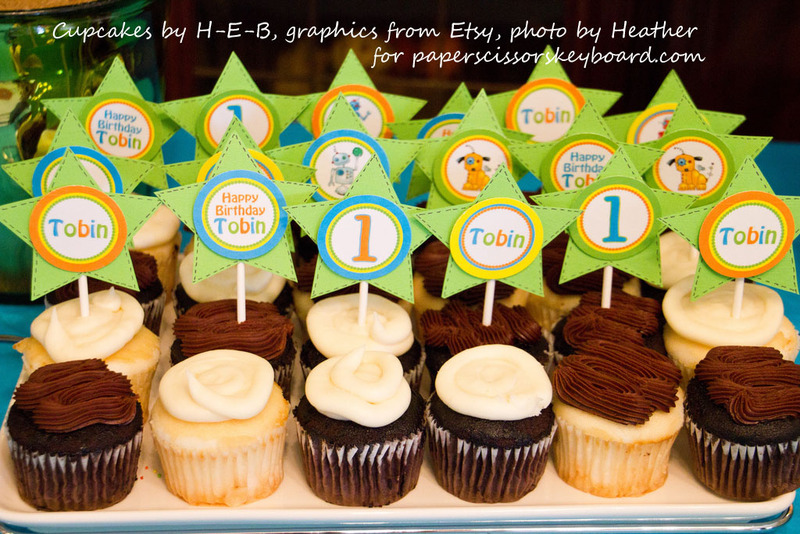 The extra graphics I didn’t use for the cupcakes went on a little banner for around T’s high chair tray. IÂ intended to make a banner with T’s pictures (from birth to 11 months), but time got away from me, so the photos went into a small scrapbook. What? You don’t have spare scrapbook albums around your home? Oh. Food was simple, just snacky stuff, hot dogs and chips. The cupcakes were purchased from H-E-B with butter cream icing I made. I also made this incredible-tasting strawberry butter cream that completely separated and is still in a bowl in our refrigerator. I will be perfecting that recipe because it tasted *so* good. 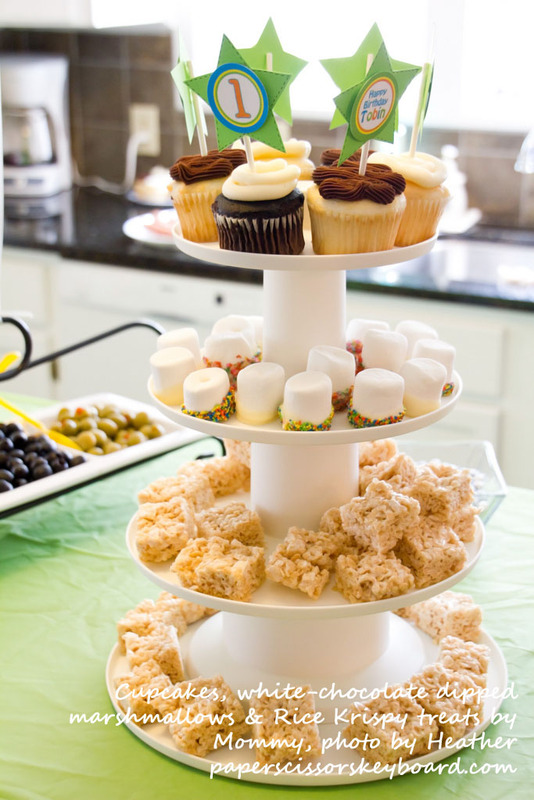 We had some fun with white-chocolate dipped marshmallows and Rice Krispy treats. 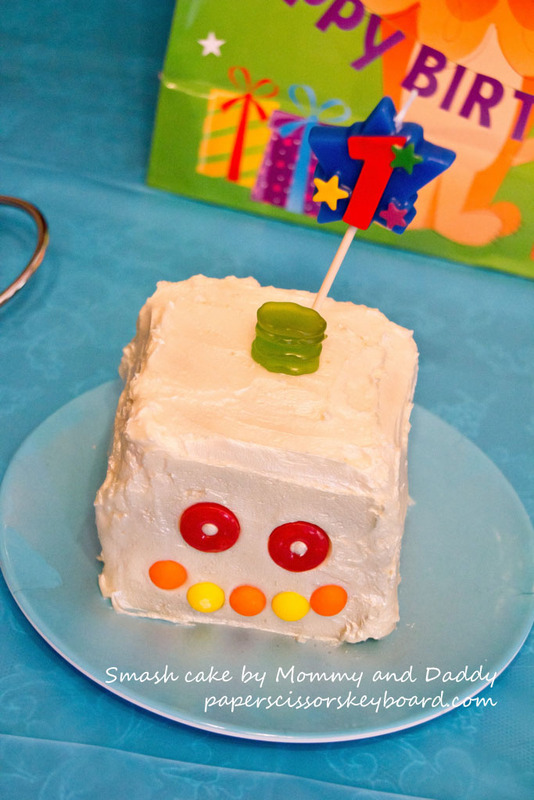 T’s smash cake was a robot head. I was going to make a complete robot, but am glad William convinced me to go the easy route. T cracked us up with his dainty eating of the icing, but once he figured out that he could smash, that poor cake was a goner. I don’t think he actually ate any of the cake at all. The best part of the party was being surrounded by friends and family who were there to celebrate this incredible little boy. We are so blessed to have people who love us so much. And I am blessed to have William who not only doesn’t make me feel crazy for wanting to do so much forÂ our baby’s birthday, but also helped me set up everything and built the robot. I can’t wait for N’s birthday this summer! What have some of your favorite party decorations been? Do you like to buy party stuff, or do you like to make it? Thanks to my awesome (and talented) friends, Heather and Rachel Matthews for their photography skills. Here are some photos of the fun! Thanks for all the robot inspiration my friend! I can’t wait to see how you inspire me next! Oh my gosh! This is SO cute 🙂 Good thing N can remember it all and tell him how cool it was!!! You totally get bonus super-cool mom points for this one.